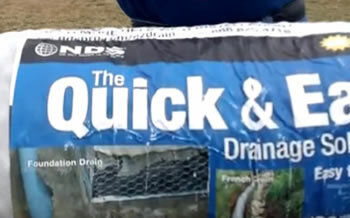 Welcome to the French Drain Man Channel. 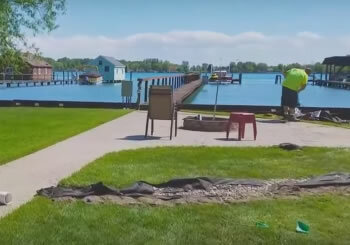 Where we’re to educate the homeowner, all the different contractors that come in with different yard water systems to help with your drainage issues. We’re going to hopefully clear some of that up today in this video right here. I know that I’m always talking about the inlet basins, but let’s, let’s provide you with some visuals. So most of what I see is a four-inch inlet and a six-inch inlet. So let’s give him the benefit of the doubt. This is a 12 by 12. Notice how it leaves all the water in the bottom of the French drain system or yard drainage system. Nobody ever wants to talk about this, so I got to be the whistleblower. I got to expose them for what they are. When the water’s running in here leaves and debris. This is directly tied to the pipe. So those leaves float and fill this pipe. It breaks down and becomes topsoil, organic material. They love getting you on a maintenance program. After a career. Putting drainage systems in. That’s great. That’s a cash grab their run around in a van and provide a service of cleaning out these systems that if they would have built them right in the first place, wouldn’t need any maintenance, they’d last forever. Now we take the stone and we bring it right to the top. The entire system is an inlet. It doesn’t get any better than that. All the water’s coming down and goes right into our French drain system. Now again, our system there is stone all the way to the bottom. So we’re going to drain our system all the way to the bottom. You’re not getting that with these basins and then it’s choking it down to a four-inch pipe, which I don’t like. I build a lot of really long runs, systems where you’re taking on your water, your neighbor’s water. You might be handling water, three, four lots of water. You’re choking it down to a four-inch pipe. The stone moves as much water as the pipe. So this is a failed experiment. I mean the jury is in. I’ve been trying to get the message across, but I think it really helps to see it like this. I really do. I hope this helps. Here’s a 9 by 9 and these are the same guys telling you they’re going 24 inches deep. Look at that. Look how that 9 by 9 sits, how low it sits in here and you’re, and you’re not going to get on the water. You’re not going to the bottom of the, of the trench. You actually damn your system. It’s no different than just having a, a dirt dam. It’s the same thing. Okay, so now here’s the six-inch. Nobody wants to talk about this. These guys, this is only eight tall, but they’re going to tell you that we’re going to go 24 inches deep. Well, that’s kinda hard to do with an eight-inch tall basin. So again, I’m just providing you with some visuals so that we could, you know, start a discussion about this and I want to educate the homeowners. We want to go about this intelligently. We’re not going to defy the law of physics and gravity and all the things that we got to deal with here. So now this is my favorite one of all. This one just kills me. Okay, so these guys are telling the homeowners, I was on several appointments this week. We’re going to go two feet deep. Okay, then how are we going to do this? Uh, where are we taking it? We’re going two feet deep and we’re taking it to a popup at the storm drain catch basin. Okay, so the pipes way up here, one, they’re not going two feet deep, but let’s give him the benefit of the doubt. Let’s say they are. Once it fills up, your yard is saturated. Once it makes it to this pipe, it’s completely soggy. This is going to do you no good. You might move some surface water, but you’re basically going to have a bathtub across the back of your lot. So this pop-up, this is the one thing that when they say we’re going to take it to a pop up to the storm drain, busted. You know that they don’t know what they’re doing. Get them off your property, throw him off your property, get them out of there before they waste your money and mess up your project. Then I love PVC conversations. Nothing’s, nothing’s more durable in the frost than this pipe. Okay, I’m going to explain why. 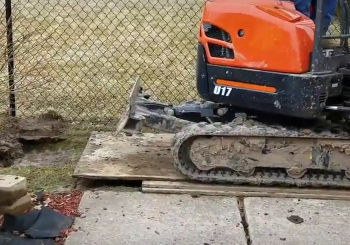 This pipe can move. As the ground moves in the frost, it’s not going to crack like a hard PVC pipe. So I really like it. Now when we do the PVC, we always use schedule 40. But it would be kind of ridiculous to build the yard drainage system on a schedule 40. This here does the exact same thing and we’re allowed to put eight inlets per valley. A schedule 40 pipe usually has a hole or two at the bottom. This has eight, eight holes in every valley all the way around. The yellow means it’s virgin material. That’s another thing I, I don’t talk about it, but I am now. The reason why I don’t use the black pipe is that it’s a saw cut. Saw cuts weaken it, and when it’s the recycled material, it loses some strength. So I don’t, I like the solid pipe for downspouts. I’m okay with that. I don’t have any problems with it. But where you have eight saw cuts, I do have a problem with it. You need a good virgin material that’s super, super strong. That’s not going to rip or tear. I liked this material lot. Again, Virgin Pipe can move in the frost. I’ve never ever seen any failure in this. I wanted to also talk about downspouts. All right. So pop-ups cost a few bucks and I guess the guys don’t even want to give you your money’s worth and they’re charging more than we do. So it’s, it’s, it’s ridiculous. Here’s a four-inch NDS cap and you could see by the way it’s shaped, it’s built for an inlet, not an outlet. You see how it has the angled like you could put this in a patio or concrete and I’m fine with that. That’s what it’s meant for. But this is not an outlet grate. I wanted to point that out, and they took a cheap 90 and just put some screws in it. So you can’t get the leaves out like our popups, our popups let the leaves out. When the leaves are breaking down, this is what it looks like. So when there’s a really hard rain, your gutters are backing up. Here’s another one. 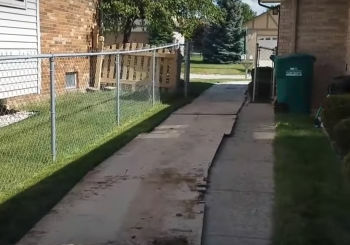 So I’m just trying to educate the homeowner and I want to make sure that the DIY guy, I really feel sorry for the DIY guys, the DIY guys that are going out and they’re spending money on materials and they work every weekend for a month or whatever it takes to get their yard drain done, and then they followed the blueprint of a system that fails. 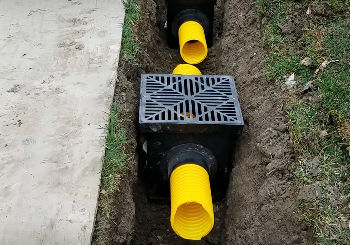 If you’re looking for a French drain system in North Oakland County or north Macomb County, Michigan, give us a call at 248-505-3065. 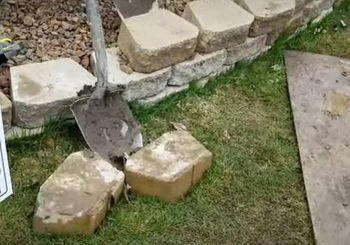 If you’re looking to learn more about yard drainage, subscribe. If you’d like to see more videos like this, please give us a thumbs up. Robert Sherwood is a professionally licensed builder at the design, building and consulting company Sherwood Landscape Construction L.L.C. in Romeo, MI. He is an expert in drainage issues teaching homeowners in water management. He has worked thousands of projects successfully removing water from properties. Over the years these clients have benefited and saved money in the preservation of home and property. Robert Sherwood is currently the project manager at Sherwood Landscape Construction L.L.C. and French Drain Man.